GBA Metroid Fusion (USA) "100%" in 1:35:19.3 by BioSpark. After a major surgery, Samus's Power Suit has been reduced in appearance. To compensate, she decides to arm herself to the teeth with 250 missiles and more power bombs than she really needs. It's her favorite thing to do when sequence breaking isn't as feasible. 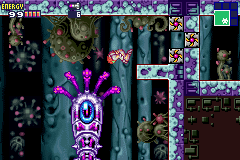 BioSpark collects all 100 capacity increasing items for Samus's health, missiles and power bombs. The abilities recovered from the Core-X are not part of this number. Like in previous Metroid Fusion TASes, lowest in-game time is top priority, sacrificing some minor tricks that save real-time but would have made in-game time slightly higher. In-game completion time is 55:28, 48 in-game seconds faster than the previous run. The real-time improvement is 30.23 seconds. It appears smaller due to 1 in-game second actually being 1.06 real-time seconds in this game. If you are interested, an alternate encode is available, that eliminates all of the door screen transitions and conversations, cutting viewing time quite a bit.